Leeds-based drainage and groundworks company, Jet Aire Services, has completed a £25,000 maintenance project at Dyke House Sports and Technology College, on behalf of Hartlepool Borough Council. The contract included a full CCTV survey of the drainage network to identify any remedial requirements followed by a programme of upgrades and refurbishment works based on the survey findings. Jet Aire applied patching to repair localised damage and used Cured in Place Pipe (CIPP) lining to strengthen the pipework, inserting a resin-saturated lining tube which was then hardened with an ambient curing method. Jet Aire Services director Keith Ferris said: “Education is one of a number of sectors in which Jet Aire Services is developing new business alongside our well-established presence in other sectors such as chemical, industrial, residential, environmental, transport and highways. 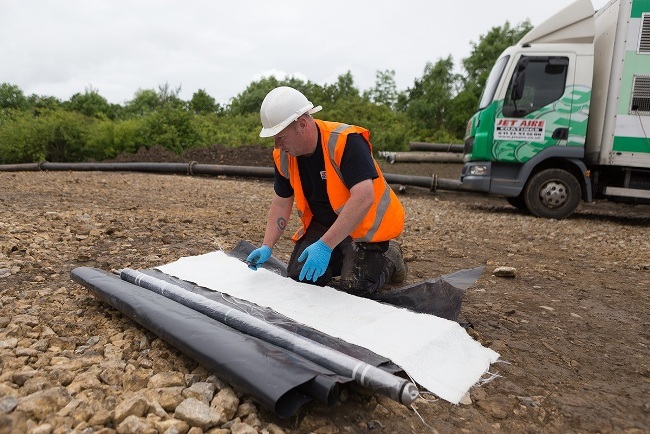 Patching and CIPP lining are two of a wide range of maintenance and remedial techniques which Jet Aire uses in the service of drainage networks. The company also provides tankering and waste disposal, UV lining, infiltration sealing, robotic cutting, root cutting, epoxy spray and Ultracoating. The launch of a groundworks division in 2017 has expanded Jet Aire’s capabilities to include surfacing, block paving, fencing, sewer adoption and civil engineering works on behalf housebuilders, highways operators and local authorities. With a Middlesbrough office in addition to its Aberford HQ, Jet Aire has ISO9001, ISO14001 and OHSAS 18001 management certification.